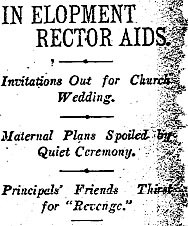 It was to be one of the grandest society weddings of the season: An orchestra was hired, a caterer had been selected after lengthy interviews, gowns for the bride and bridesmaids had been sewn and the Hotel Lankershim had been hired for the occasion. In preparation for the grand event, Dr. Harris C. Garcelon and his fiancee, Genevieve Smith, attended the wedding rehearsal at Christ Episcopal Church performed by the Rev. Baker P. Lee.